For those who don’t know, Jim O’Horo holds the title of longest running volunteer with Community Cycling Center in its entire history. Having started his stint with us in 1996 on a suggestion from a former Bicycle Transportation Alliance staffer, his presence was frequent and widespread. 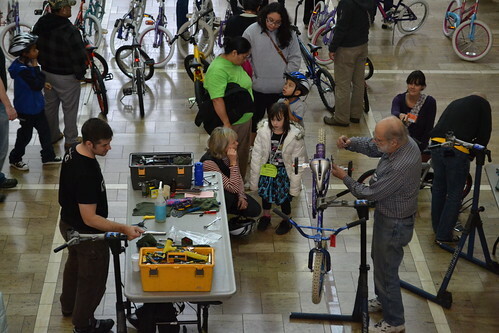 Most of his energy, however, was spent supporting the various programs that brought bikes to the youth of Portland: Ride to School and Back, Bike Safety Club, Holiday Bike Drive and eventually Guest Mechanic for Bike Clubs. When I was a new staff member at the Community Cycling Center in 2009, I heard of Jim well before I met him. One time I saw him teach members of the Portland Wheelmen Touring Club how to refurbish a kids’ bike while sitting in a chair, not touching the bike once! Over a slice a pie with Jim and another long time volunteer, Dave, Jim told me how he once mentored an eager, young rider. So that this rider may ride his first century, Jim towed him into a headwind for 80 miles! 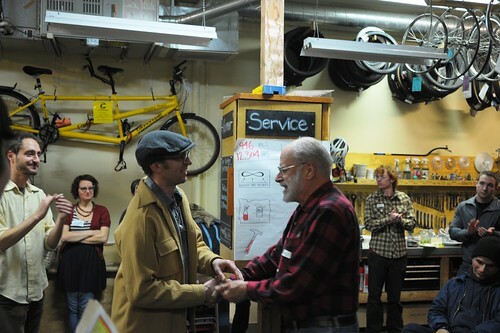 Jim overheard me telling new volunteers about the need for volunteers at the Bicycle Repair Hub in New Columbia. Without a second thought, Jim was up at the Hub the next week, used parts arsenal in tow. Having battled cancer for many years, Jim passed away on Christmas Day last month. He’ll be missed.